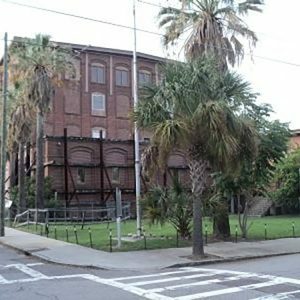 Built c.1882, this five-story structure was the commercial site of the Charleston Manufacturing Company and later the Charleston Cotton Mills. In 1903, the American Tobacco Company leased it and purchased it outright in 1912. Known as “the Cigar Factory,” it produced cigars until 1973. Employing some 1400 workers in 1945, 900 of whom were African American women, the Cigar Factory workers struck for higher wages and an end to discrimination. Strikers sang the gospel hymn “I’ll Overcome Someday.” Later this song was revised as “We Shall Overcome,” and became one of the most popular Freedom Songs of the Civil Rights Movement.